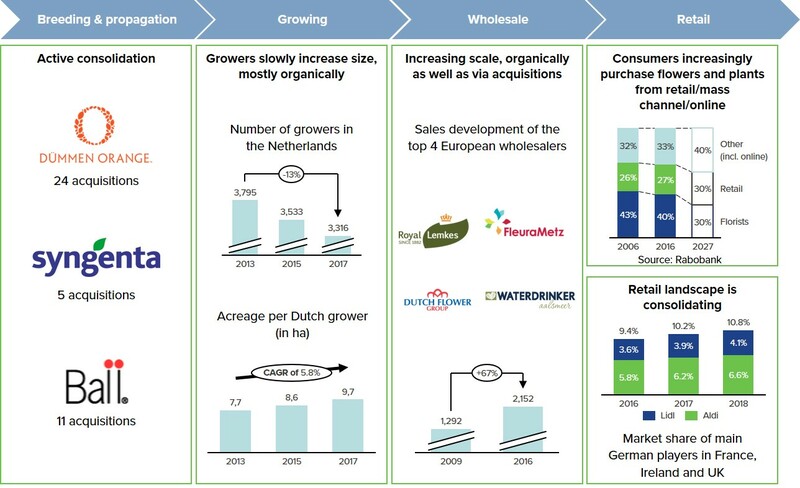 Certain parts of the horticulture value chain have experienced a great amount of consolidation in recent years. In the initial stages of the value chain, breeding platforms are acquiring smaller peers that provide them with access to new products, geographical markets and/or clients. By leveraging on their advanced breeding techniques, economies of scale and one-stop-shop product offering, consolidators aim to beat the competition [CR1] in these new areas. At the other end of the value chain, mass retail and online channels are gaining considerable market share. Mass retailers in particular prefer to deal with large counterparts, and with a lack of large growers to do business with directly, they turn to wholesalers. 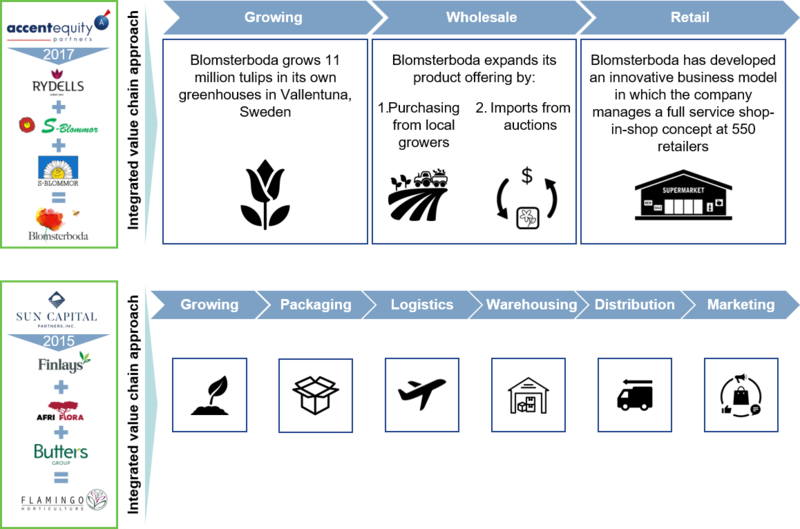 Subsequently, wholesalers are also increasing scale, both organically and by acquisitions. As part of a highly scattered landscape, growers find themselves in a squeeze between larger counterparts, which puts pressure on their profit margins. In North America, the consolidation of the mass retail landscape has been going on for many years and, nowadays, there are just a few large players that dominate the continent. Their preference to do business with a limited number of large (institutionalized) suppliers and their strategy to skip parts of the value chain in order to reduce costs and increase margin have triggered a consolidation among growers in the last decade. In the USA, for example, the 100 largest growers have a combined floriculture greenhouse market share of 60%. 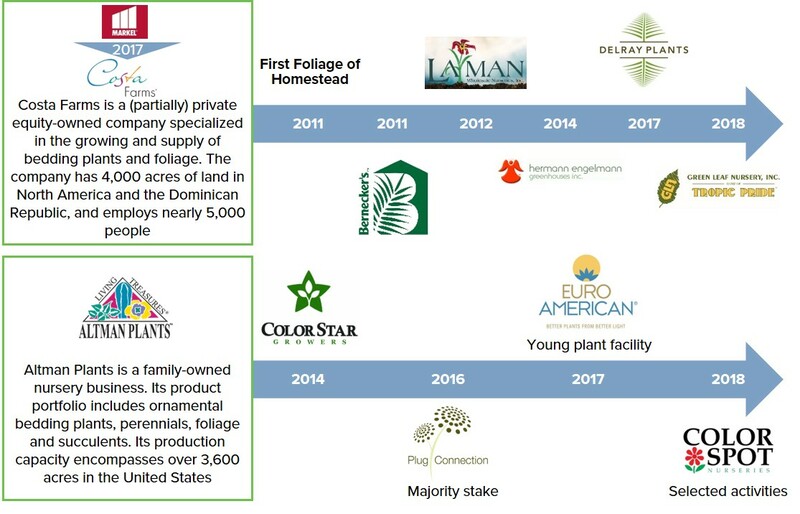 Prime examples of North American consolidators are Altman Plants and Costa Farms, which have, by organic growth as well as via acquisitions, become the largest producers of ornamental plants in North America and even the world. At the moment, over 10% of the floricultural greenhouses space in the USA is owned by these two parties. As Altman Plant’s most recent acquisition almost doubled the company’s size, Altman is likely to be busy with the integration for some time to come. With the backing of Markel Ventures, which became a shareholder in 2017, Costa Farms is likely to continue its acquisitive growth path. In Europe, Africa and Asia, the retail landscape is not as consolidated as in North America. The grower landscape is even more scattered, with the largest European grower, for example, having not even 1% market share. The grower landscape is changing, with the number of growers declining and the surface per grower increasing. The change is, however, mostly driven by organic growth, with very few acquisitions. In addition to the changing supplier, wholesaler and retail landscape, there are a number of other market dynamics that are impacting the world of growers. Examples are the increased technology standards, shifting consumer preferences, the increased importance of marketing, fair trade and sustainability (certificates) becoming an industry standard, and increased activities in low-cost countries. 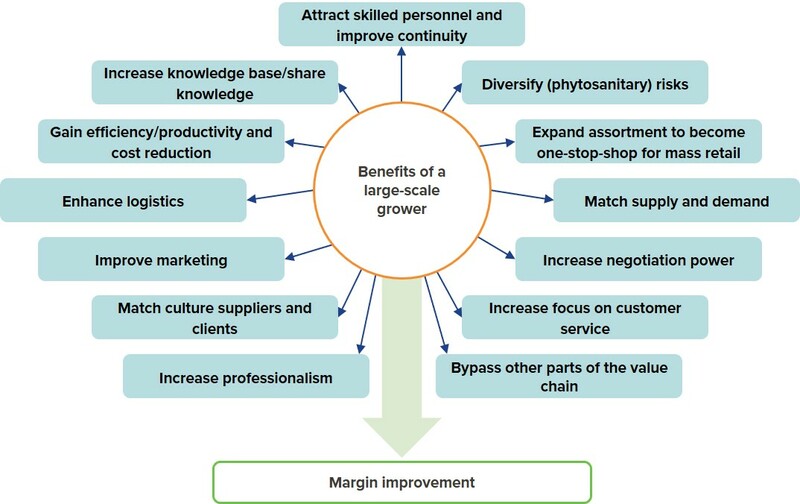 Together with many companies having succession issues at management level, these factors emphasize the urge for more professional and larger growers, and preferably even platforms that can supply their clients with a large spectrum of products and that fit into mass retail’s category management approach. Next to upscaling by means of expanding own capacity and acquiring peers, the changing forces in the value chain are also resulting in a trend towards becoming an integrated player and developing new business models. This also fits the framework of scaling up, increasing efficiency and gaining power in the value chain — all geared to increasing margins.